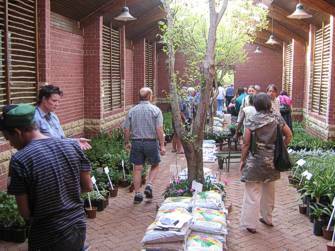 The Visitors’ Centre includes a curio shop/ ticket sales point and a plant sales nursery. It is open 7 days a week from 08h00 to 17h00. The curio shop offers a variety of crafts, books and gift cards. We encourage the use of indigenous plants by making them available at competitive prices. This service is available daily and other gardening materials are available for purchase at the sales nursery next to the curio gift shop / ticket sales. The Visitors’ Centre also serves as an information centre for visitors to the Garden. Here visitors will find survey forms, a brochures display, a “what’s-flowering” display and a guest book is available for the public to communicate their impressions and suggestions to us.